Grind & Shine operates in Sydney, Brisbane, Newcastle, the Central Coast, Wollongong and Northern Tablelands, and anywhere in NSW, QLD, VIC. WHY CHOOSE Grind and Shine? 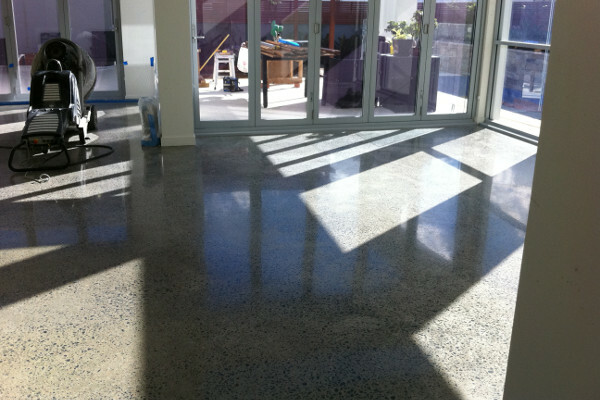 Concrete floors will not chip or dent like softer surfaces such as timber and is easy to maintain. Mopping with warm soapy water once a week is the only maintenance required. 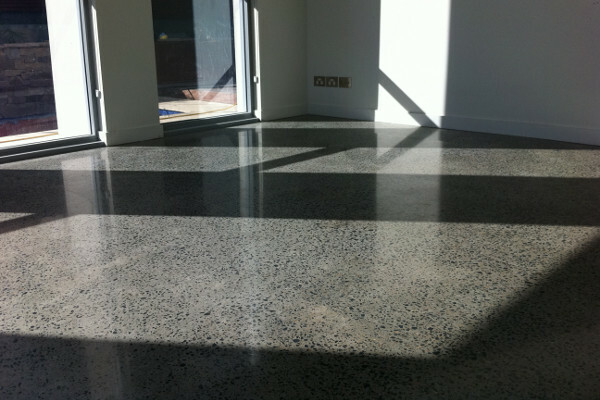 Polished concrete flooring can actually be warm underfoot. Concrete provides thermal mass to a home and if your home is designed correctly the concrete will be warm in winter and cool in summer. 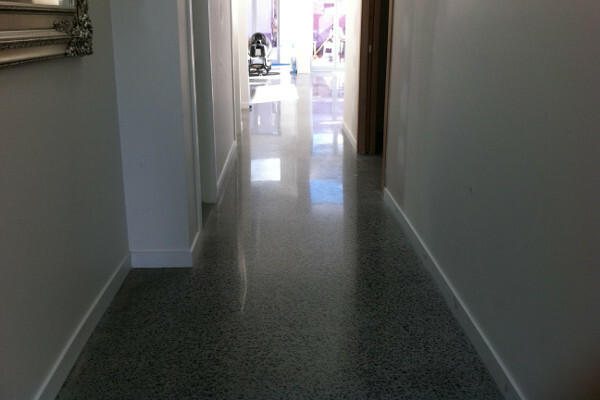 ( Speak to a building designer or an architect for more information) Cost of polished concrete floors Polished concrete flooring is comparable in price to other high-end floor finishes such as marble tiles. 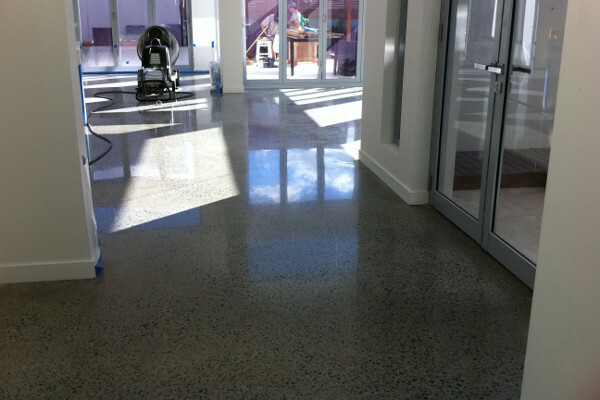 The cost of polished concrete floors is offset by virtually no maintenance costs. Timber floors, for example, have a relatively high maintenance cost and are not nearly as durable. 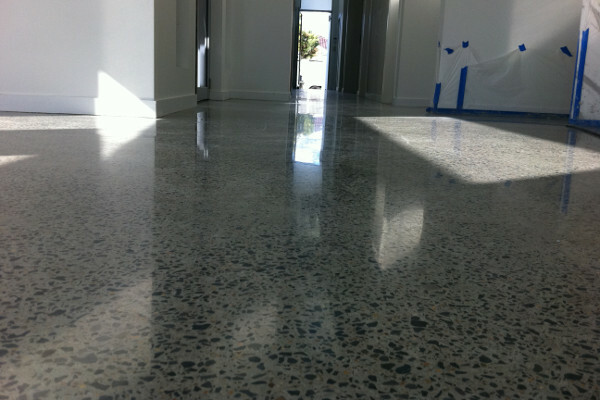 If we are talking 'flavour the month' in architectural flooring, polished concrete would have to be 'it'. Already popular in commercial buildings, concrete flooring is now becoming popular in the residential sector. 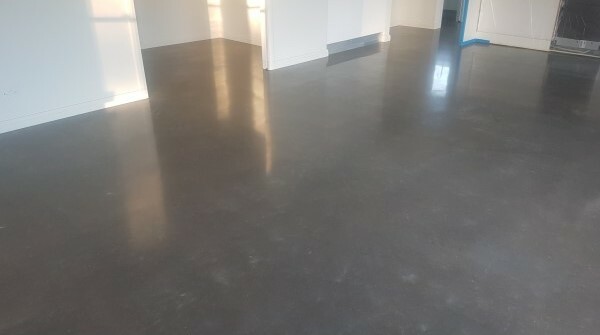 Polished concrete floors are relatively easy to install, hardwearing, easy to maintain, cost effective, sleek-looking and will last a lifetime. These floors look great in all areas of the home, not just bathrooms and kitchens and can be used as an alternative to traditional benchtop materials. 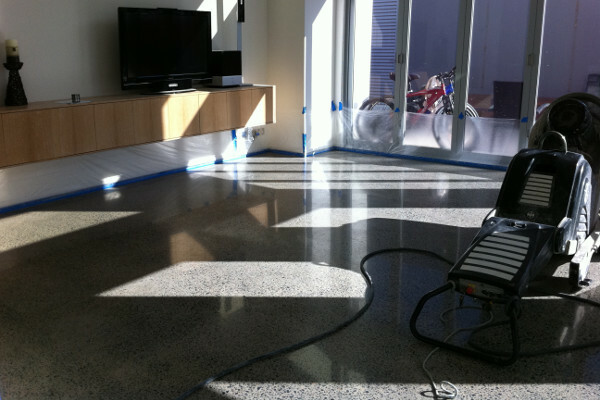 Polished concrete floor installation is categorised into two types: New concrete floors and retrofit concrete floors (a.k.a.concrete resurfacing). Retrofit floors or concrete resurfacing can be done in two ways. The existing floor slab can be cut (sanded) and the natural aggregate will be the feature (usually black basalt) or a toping slab with a minimum thickness of 50mm can be added on top of the existing slab. Keep in mind if you use a topping slab door and ceiling heights will be affected. The concrete floor is cut with a sander 3-4 times depending on the finished surface and the desired aggregate exposure. This can be done wet or dry depend on the site situation, This process will remove 3-5mm of concrete thickness. If it is a new slab the cutting should occur before any walls are erected to ensure the best finish (it is harder to work around walls). Note: sanding before the walls are constructed keeps the mess to a minimum. The surface is then grouted with cement to allow imperfections and air bubbles to be filled. Two more cuts are done after grouting. A clear liquid hardener (densifier) is then worked over the surface with a window squeegee. The densifier will provide a very glossy look to the finished floor and gives the floor extra strength. The densifier is worked into the slab for about 1 hour and will soak into the slab 5-10mm. This will require overnight curing before more cutting is done. 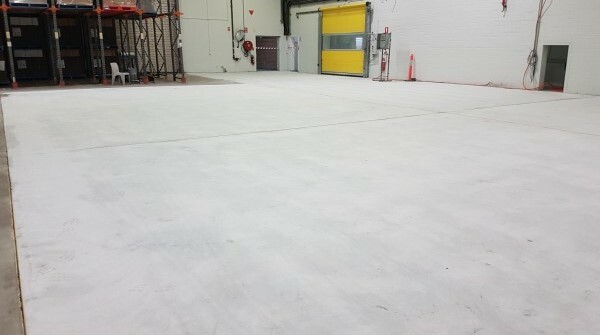 The concrete floor is then cut another three times - this is the final polishing stage. Lastly all the concrete floors are to be sealed. There are two main types of sealing processes: Diamond finish is where the concrete is sanded 3-4 for times with varying grades of sanding paper and sealed with a standard stone or tile sealer. Epoxy finish is applied in two layers with sanding over both layers with varying grades of sandpaper. Both sealing systems reduce any oil staining and reduce mould build-up in wet areas. A standard floor sealer for stone and tiles can be used or you may like to use an epoxy finish. If possible have your floors polished before the walls go up. Finishing and polishing the edges of a room with walls is time consuming and adds a lot to the cost. 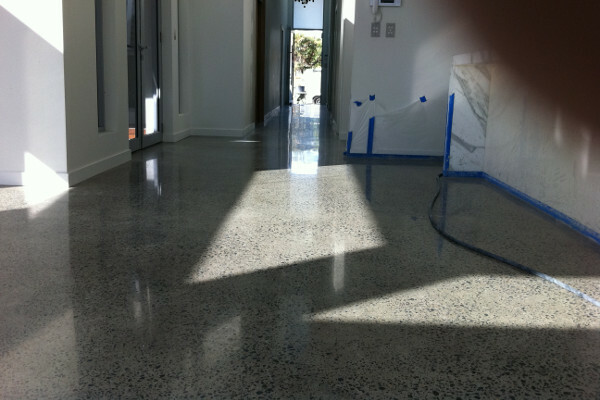 Grind & Shine are specialists in high-end concrete floor applications and are able to apply their finishes to existing or new concrete floors in trendy bars, boutique stores, art galleries as well as high-end architectural homes.